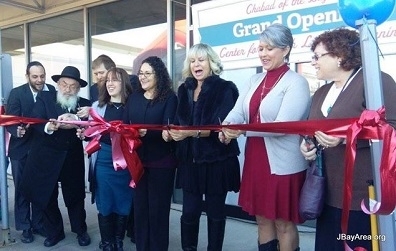 A wonderful crowd turned out this past Sunday for the Grand Opening and Inauguration of the Chabad Bay Area's new Center for Jewish Life and Learning! Joining in the ribbon cutting at the Chabad Bay Area – Center for Jewish Life & Learning. 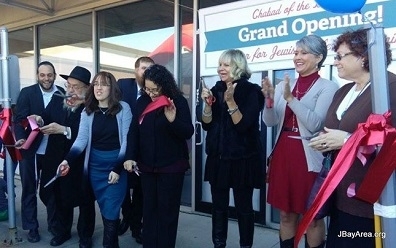 L-R: Shlomi Wolraich, Galveston; Rabbis Shimon Lazaroff, Houston; Rabbi Yitzchok and Malky Schmukler, directors; Mardy Schweitzer, Clear Lake; Lynn Donovan, Galveston; Councilwoman Heidi Hansing, League City; Ida Diamond, League City. As we near the end of 2015, please consider making a tax-deductible contribution and stay tuned for details about our special upcoming End of the Year Matching Campaign to be held on December 17th. Tomorrow: Special Shabbat w/ Lunch! Join us tomorrow Saturday, November 14th for a special Shabbat! Sponsored by Alex & Dara Dinur in honor of their daughter Ella's birthday! Exciting Chanukah Events - Save the Dates! 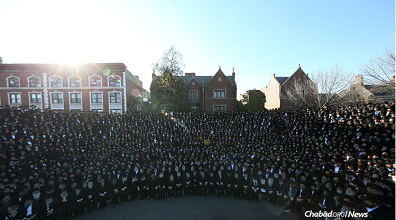 Thousands of rabbis attending the International Conference of Chabad-Lubavitch Emissaries (Kinus Hashluchim) pose for the annual group portrait in front of Lubavitch World Headquarters in the Crown Heights neighborhood of Brooklyn, N.Y. The corresponding women's convention of Shluchot (Emisasries) is held in February. Can you spot our rabbi in the picture? Haven't signed up for our JLI course, Journey of the Soul, but would be interested in checking it out? How about joining us this Tuesday night to for your free sample lesson, as we discuss the Jewish take on Heaven, Hell and Reincarnation. 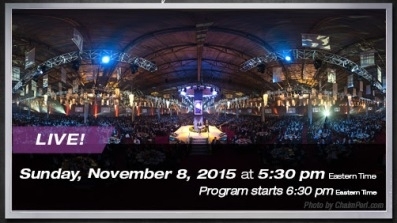 The Gala Banquet of the International Conference of Chabad-Lubavitch Emissaries will air live Sunday evening, November 8, at 6:30 pm ET (5:30 Central) on Jewish.tv. The gala banquet culminates a five-day annual conference attended by more than 5,000 Chabad-Lubavitch emissaries, lay leaders and supporters in New York.